1) First Of All, Download Or Update My Jio App. 2) Open App After It Has Been Installed. 3) Login Or Sign up For New Account. 4) On The App Dashboard You Will Get My Voucher Section, Just You Have To Click On It. 5) Once The Voucher section Has Been Opened Click On Buy Button. 6) There You Will Get Multiple Recharge Plan Out Of Them You Need To Select Plan Worth Rs.98 Or Rs.149 Only. Select One Which You Want To Initiate. 7) Scroll Below & Select Rs.11 Plan Along With The Needed Plan i.e, Rs.98/149. 8) Yo! Now You Are Eligible To Apply Rs.50 Voucher On Recharge. 9) Complete The Transaction Via PayTm to Get Additional Rs. 50 Cashback On 2nd Transaction On Jio. 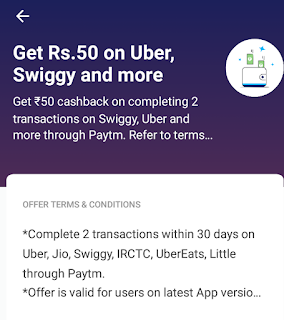 Note :- Make sure your PayTm account has Jio, Uber, Swiggiy 2 pay 50 offer. This offer will Is Valid For Once/Day. 10) Yayy! Through This You Will Get Instant Rs.50 Discount On Rs.98 Or Rs.149 Jio Recharge Plan. *You Will Recieve Rs.50 In Your PayTm Wallet For 2nd Transaction On Jio. 3. So, Total amount You Pay is Rs. 59 +Rs. 59 = Rs. 118. 4. You Recieve Rs. 50 In Your PayTm wallet For 2nd transaction. So, Rs. 118-Rs.50 =Rs.68. Hence , You Pay Rs. 68 For 2 Months Jio Recharge. So,This Means Rs. 34 For 1 Month Jio Recharge. You Got 2 Vouchers of Rs. 98 & 2 Vouchers Of Rs. 11 At Just Rs. 68.